The term 'Lean' was coined in 1990 by MIT researchers studying the highly successful Toyota production system. Since then, the understanding and implementation of lean principles have permeated many sectors aiming to eliminate mistakes, reduce delays, lower costs, and improve the overall quality of a product or service. This practical guide developed by METTLER TOLEDO explains how to cultivate a lean culture in your laboratory by sharing perspectives and good practice, including innovative technological solutions. These are summarized in 9 steps. 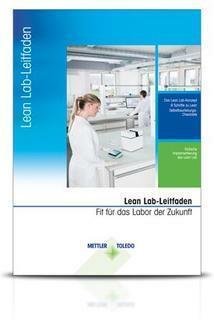 This practical guide developed by METTLER TOLEDO outlines the Nine Steps to Lean and their role in cultivating a lean environment in the laboratory by combining good practice with innovative technological solutions.